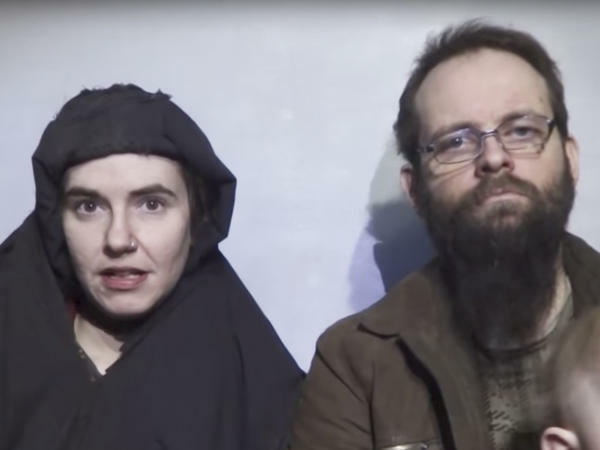 In this image from video released by Taliban Media in December 2016, Caitlan Coleman talks in the video while her Canadian husband Joshua Boyle holds their two children. U.S. officials said Pakistan secured the release of Coleman of Stewartstown, Pa., and her husband, who were abducted five years ago while traveling in Afghanistan and then were held by the Haqqani network. The Toronto Star's Michelle Shephard spoke with NPR's Renee Montagne on Weekend Edition Sunday about her conversation with the family patriarch. Boyle talked about the conditions the family endured, including being held underground and at times in cells no larger than the size of a bathtub. He also told Shephard his wife was forced to have an abortion, referencing the infant daughter he said was killed. Coleman's father has publicly criticized Boyle for taking his wife into Afghanistan, where they were kidnapped. During the press conference, Boyle said they were entering the country as pilgrims, intent on helping the people living in Taliban-controlled regions. Shephard, who recently met the couple's three children, said they are experiencing "a series of firsts" since being rescued. Shephard observed their older son repeatedly flushing a toilet because he'd never seen one that flushed before. "You can imagine for five years, especially with children, just having nothing. So he said it was very very rare they got anything to read. Once they had sort of a slate with chalk and they used that, but for the most part they had nothing. So it was just after Trump's inauguration that they were forced to do a proof of life video, and Josh said at that point that's when he was told that Donald Trump was elected, and he actually said he thought it was a joke. They'd been in this bubble for four years at that point..."
"It was amazing the series of firsts that they were experiencing. The older son, Jonah, kept flushing the toilet. He'd never seen a toilet that flushed. You can just imagine, they've had no other life than being hostage. They were all born in captivity. The second youngest son, or the younger son, he apparently experiences a lot of terror. He'll scream, I didn't see this, but he apparently will scream for part of the day. He's terrified of boots. Clearly ... those two boys are going to need a lot of psychological care, and I think the family is reaching out to get that now." NPR Digital News Intern Isabel Dobrin produced this story for digital platforms. And an American-Canadian family are recovering in Ontario after being rescued from kidnappers in Afghanistan. Joshua Boyle and his American wife, Caitlan Coleman, had been held captive by the Haqqani network since 2012. They were rescued by the Pakistani army this past week. The couple's three children were all born in captivity. Boyle gave a brief statement after landing in Toronto. JOSHUA BOYLE: The stupidity and the evil of the Haqqani network's kidnapping of a pilgrim and his heavily pregnant wife engaged in helping ordinary villagers in Taliban-controlled regions of Afghanistan was eclipsed only by the stupidity and evil of authorizing the murder of my infant daughter. MONTAGNE: The Toronto Star's Michelle Shephard joins us now from Toronto. Boyle gave his first wide-ranging interview to her. Welcome. MONTAGNE: Now, you sat down with Joshua Boyle at his parents' home yesterday. What did he tell you? What are some of the details that came out about their captivity? SHEPHARD: He spoke a little bit. I think there are going to be more stories to come in the next week. But he spoke a little bit about how they were held - in the conditions with which they were held. MONTAGNE: Right. They were being moved from Afghanistan into - across the border to Pakistan. SHEPHARD: Yeah, he said - when we spoke yesterday, he said he thought that he - over the five years, they had been held both in Afghanistan and Pakistan near the border region. And when - Wednesday, when they were rescued, they were actually in the trunk of the car, which is often how they were brought back and forth. MONTAGNE: You know, one detail that emerged from your interview with him was a simple one but a kind of shocking one. They had nothing to read the whole time. So they had to be told that, you know, Donald Trump had been elected president. SHEPHARD: That's right. That's right. And, you know, I - probably like you, I've covered various hostage stories. And I've had some friends that actually have been kidnapped. And they often speak of the boredom. And you can imagine for five years, especially with children, just having nothing. So he said it was very, very rare they got anything to read. Once, they had sort of slate with chalk. And they used that. But for the most part, they had nothing. So it was just after Trump's inauguration that they were forced to do a proof-of-life video. And Josh said at that point, that's when he was told that Donald Trump was elected. And he actually said he thought it was a joke. He - they've been in this bubble for, you know, four years at that point. And the kidnapper said, you know, you have to mention Donald Trump in this. And he didn't believe that he was president. MONTAGNE: Boyle says his wife was raped by a guard in his statement. You also spoke in your article of a forced abortion. Is the daughter that he said was murdered the result of a forced abortion? SHEPHARD: That's right. I think there was a lot of confusion when he made a statement at the airport Friday night after landing because he had said his daughter was murdered. He's referring to an incident - I believe it was in 2014 - that he claims that his wife was - had forced abortion. And that was the daughter that he speaks of. MONTAGNE: Now, Caitlan Coleman's father - his wife's father has been very public about his anger asking, why did Joshua Boyle take his wife into such a dangerous place? That question is starting to come up now as the days go on. What did he say about the suggestion that he had, as it turned out, was an activist on behalf of a Guantanamo detainee. MONTAGNE: He was once married to the sister of that detainee. I mean, what did he say about how he might've had some special mission? SHEPHARD: He had said - it was the first time, again, on Friday night when he came back and he made that statement. He said that when they were in Afghanistan, they were pilgrims trying to help those in a Taliban-controlled region. He hasn't gone much further into that. His family knew that they were backpacking across Central Asia at that time. They didn't know that they were crossing over into Afghanistan. Yesterday, when I asked him on this, he said, you know, any suggestions that they were there for some other reason were just ridiculous and that he was far more a hippie. They did have a history - the couple - of doing charity work. And I think, you know, they were painfully naive in the area that they were going to. But I do expect he's going to talk more about that in coming days, too. MONTAGNE: Well, in just the short time that we have left, this was clearly a horrendous five years. How are Caitlan and the children doing? SHEPHARD: The children were great. I got to see them for the first time yesterday. And it was amazing - the series of firsts that they were experiencing. The elder son, Jonah, kept flushing the toilet. He had never seen a toilet that flushed. You can just imagine. They've had no other life than being a hostage. They were all born in captivity. The second youngest son - the younger son - he apparently experiences a lot of terror. He'll scream. I didn't see this, but he apparently will scream for part of the day. He's terrified of boots. Clearly, they're going to need - those two boys are going to need a lot of psychological care. And I think the family's reaching out to get that now. MONTAGNE: All right. Well, that's Michelle Shephard, national security reporter with The Toronto Star. Thank you very much for being with us. SHEPHARD: Thanks for having me. (SOUNDBITE OF AT THE END OF TIMES, NOTHING'S "THE GROUND AFTER A SUMMER RAIN") Transcript provided by NPR, Copyright NPR.